This split tape features two of John Murphy’s current musical outlets and contextually functions as a sort of unofficial addendum to the recent Last Dominion Lost ‘Towers of Silence’ LP, particularly as the two releases were issued at the same time and via the same label. By way of background Krank is John Murphy’s long running solo project which has a legacy spanning back to 1981 (under the original Krang Music name), but is assisted here by Till Brüggemann, who incidentally also guested on Last Dominion Lost’s recent album. Alternately The Grimsel Path features the two main Last Dominion Lost members John Murphy and Jon Evans, noting also that the moniker The Grimsel Path has contextual links back to Last Dominion Lost, with this project name being a track title off the first Last Dominion Lost album. With background context out of the way Krank lead off the tape with the single 20 minute composition ‘NAOS Number 1’. The piece is an 80’s sounding ritual industrial soundscape, consisting of grinding synth textures, scattered wavering tones, fragmented sonic oscillations and occasional percussive elements such as bells and singing bowls etc. The composition is quite loosely structured with not real driving rhythm or beat, rather is built around blown out abstract synth chords, with a very analogue tone and associated sonic warmth. Also featured are liquidous sounding ‘micro’ tones and contact mic-ed clanging metal on metal arrhythmia. Whilst there is an element of freeform improvisational playfulness its sound, the track is also carefully controlled and paced to generate its grimly dissonant atmosphere. For The Grimsel Path’s six tracks, these are live recordings from 2012 when the group performed at the Foetus Frolics Festival in Berlin and inhabits quite a similar tonal sphere to Krank’s side. In fact if you were to not closely listen to the material you might be of the impression that both sides of the tape are from the same project. Nevertheless where The Grimsel Path’s side differs is that it is slightly more focused due to the format of shorter stand alone tracks and includes sporadic vocalisations which are wholly absent from Krank’s side. The sound could also be described a slightly less refined version of the experimental/ industrial/ ritual soundscapes found on the recent Last Dominion Lost offering. Unhinged clanging electronics, misfiring machinery and general industrial debris mark the opening piece ‘Deviation’, whilst ‘Scortched Earth’ features humming suspenseful horror synths (aka Angelo Badalamenti style), otherworldly vocalisations and a production of cavernous echoed depths. ‘Run Please Master’ then ups the ante somewhat with a stilted rhythmic drive and cinematic synths late in the track, whilst ‘Sideshow of the Soul’ features a low bass throb, over which a mostly subdued but sometimes chaotic scattered industrial noise soundscape is positioned. 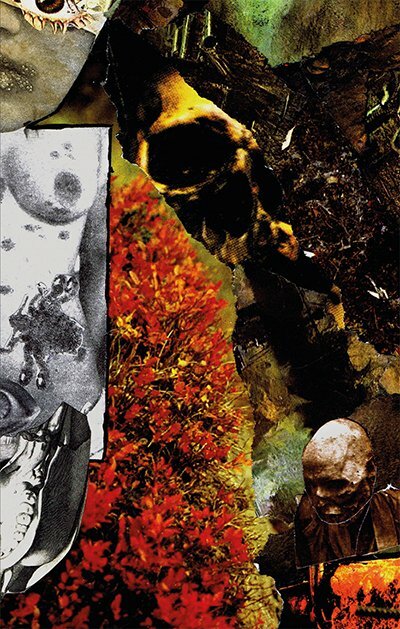 For the visual side of things the collage artwork courtesy of Kristian Olsson is suitably grim and ‘industrial’ in tone, with the music featured on a pro-duplicated tape. Where ‘Verdant Hum’ succeeds is in the fact that it is another fine example of a release featuring the best elements of an early industrial ritual sound without sounding purposefully ‘retro’ or ‘old school’. A worthy release warranting more than the limitation of 100 copies which were pressed, and perhaps demands a vinyl repress at some point. This entry was posted in 2014, experimental, industrial, ritual, The Epicuriean by noisereceptor. Bookmark the permalink.